[prMac.com] Toronto (ON) Canada - Zevrix Solutions today is proud to announce the release of Deliver Express 2.6, a feature update to its automated solution to send and share files easily across the Internet and local networks. 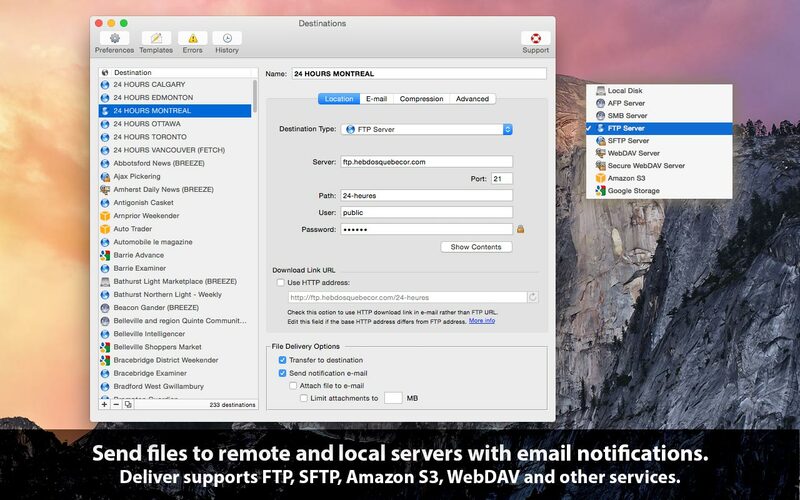 Deliver Express processes files from watched hot folders and supports FTP, Amazon S3, WebDAV, AFP and other remote and local services. The software can run absolutely unattended and offers variable email notifications, delivery to multiple destinations, file compression, automatic PDF creation, and much more. The new version introduces support for FTPS connection which helps ensure secure, reliable and auditable file transfer. FTPS (also known as FTP-SSL) is an extension to the commonly used FTP protocol that adds support for the Transport Layer Security (TLS) and the Secure Sockets Layer (SSL) cryptographic protocols. "What's great about Deliver Express for organizations is the unattended nature of using a hot folder," writes Jeffrey Mincey on Mac360.com. "It's perfect for all kinds of file delivery. Sensitive documents, encrypted files, financial information, graphic files, photographs, large files and so on." Deliver Express is an ideal solution for ad agencies, photographers, recording studios, printers, law offices and other users. Users only need to drop their files to the app's hot folders and they will be sent automatically with email confirmations issued upon delivery. Recipients can easily retrieve the files through the link in the notification email. Deliver Express can be purchased from Zevrix website as well as from authorized resellers. The license prices are based on the maximum number of allowed destinations and range from $29.95 to $299.95 (USD). The update is free for licensed users. Trial is also available for download. Deliver Express requires OS X 10.5-10.12 (some features require OS X 10.7 and later).